The Valletta Green Festival will be held from the 29th till the 31st May and seeks to raise awareness about, and contribute to, Valletta’s ecological aspects. Apart from the infiorata, the Recycled Percussion workshops will take place on Saturday 30th May from 10am till 1pm, at Pjazza San Ġorġ, Valletta. Addressing a press conference, Mr Micallef said “Valletta 2018 is working on sustainable, long-term projects such as the Valletta Green Festival as part of the Cultural Programme in preparation for 2018. “The Foundation is focusing on the cultural, economic and social regeneration of Valletta while contributing and encouraging environmental and ecologic improvement”. The opening ceremony included the inauguration of a colourful infiorata, which was constructed overnight by Environmental Landscape Consortium workers. Made up of over 80,000 seasonal potted flowering plants which were placed next to each other, the infiorata features a spiral design. In his vision, artist Daniel Mercieca, was inspired by Maltese Megalithic temples – a strong primal symbol of our cultural heritage. The Minister for Sustainable Development, the Environment and Climate Change Leo Brincat, Environmental Landscape Consortium Chairman Peter Calamatta, Valletta Mayor Alexiei Dingli, as well as students from St Gorg Preca College, Valletta Primary School, participated during the opening. The Valletta Green Festival will be held from the 29th till the 31st May and seeks to raise awareness about, and contribute to, Valletta’s ecological aspects. Apart from the infiorata, the Recycled Percussion workshops will take place on Saturday 30th May from 10am till 1pm. The LifeMed Green Roof Project and WasteServ Malta will also be holding information sessions at various times during the festival. Elevated view points have also been installed to allow for easier photography. One of these is equipped with a ramp, allowing access for people with a disability. The newly-launched cultural hotspot mobile unit, also a Valletta 2018 initiative, is also situated in Pjazza San Ġorġ for the duration of the Valletta Green Festival. “I would like to thank everyone involved in this initiative which sees a wider range of activities taking place in comparison with last year. This activity is laying emphasisis on the cultural, economic and social regeneration of Valletta. The Valletta 2018 Foundation is giving due importance to the environmental and ecological improvements” stated the Minister for Sustainable Development, the Environment and Climate Change Leo Brincat. Also speaking at the press conference, Environmental Landscapes Consortium Chairman Peter Calamatta said, “It has been a challenge to grow the flowers and have them in top condition in time for the festival. 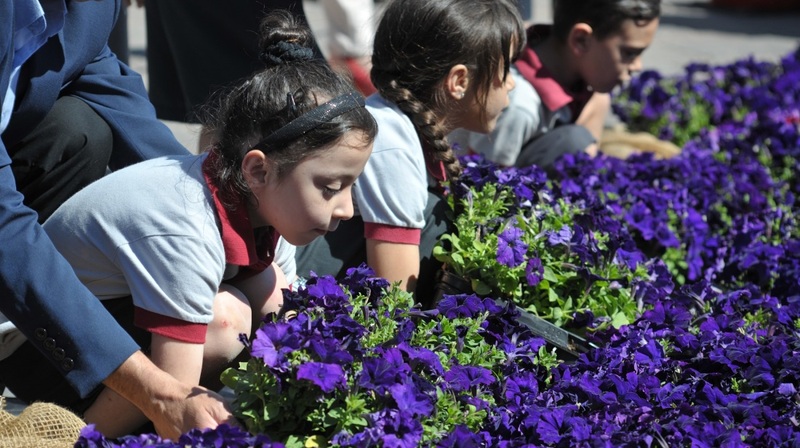 Once over, the flowers are replanted in public gardens around Malta and Gozo”. The Valletta Local Council has been working in synergy with the Valletta 2018 Foundation. Mayor Alexiei Dingli highlighted that the infiorata is at the heart of Valletta, while encouraging residents to set up such initatives in their own homes. The local council will also be organising a clean up initiative in several areas of Valletta on Saturday 30th May. 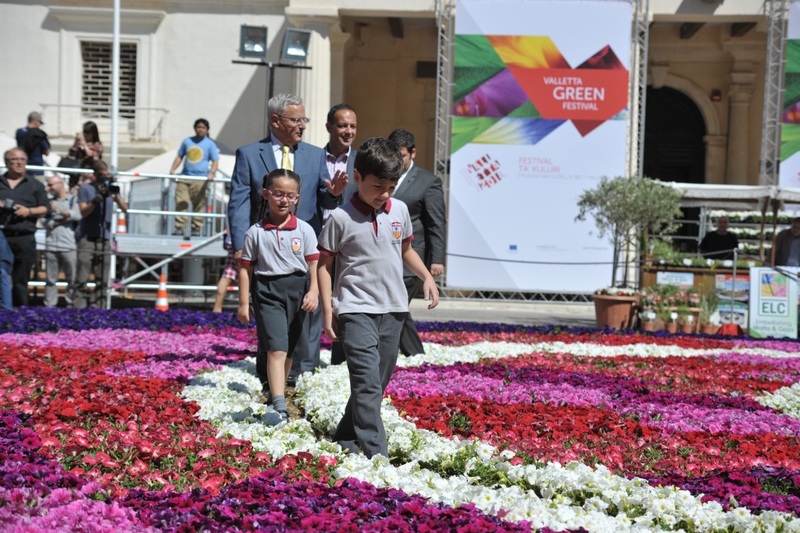 The Valletta Green Festival is being held in collaboration with the Ministry for Sustainable Development, the Environment and Climate Change and the Environmental Landscapes Consortium.